Physical or built capital provides a range of benefits for communities ranging from transportation to housing. These services provided by infrastructure are crucial elements that a community requires to function. “One unique aspect of physical capital is its immobility” (Green and Haines, 2016). The condition of physical capital also has important connections to other capitals. For example, adequate transportation infrastructure can help ensure that community members are able to get to work successfully, enhancing human and financial capital. 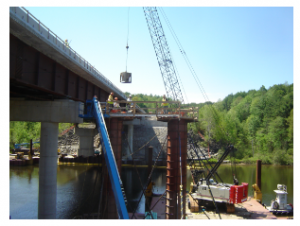 In Milton, VT construction is being finished on a bridge that spans the Lamoille River. This bridge is also part of I-89, a major interstate in Vermont. The project began in January, 2014 and paving the new bridge began last month. “The original bridges were built in 1967 and showed signs of fatigue, state engineers said” (Lamdin, 2016). Physical capital can provide services for long periods of time but maintenance is required to ensure safety and efficiency. The bridge project also involves a number of local subcontractors such as Donald H. Turner Excavation, LLC. This Milton-based utility service company has helped with excavating for the new bridge. This project is also part Vermont’s Agency of Transportation’s Accelerated Bridge Program. “Today, the program continues to deliver projects quickly and relies on accelerated bridge construction as a means to reduce road closure durations” (VTrans, 2016). The Accelerated Bridge Program acknowledges the challenges of construction and maintenance, and strives to minimize the difficulties in keeping physical capital functioning. Physical capital such as roads, housing, and sewage systems allow a community to function. In Milton, VT a major bridge that has allowed travel up and down I-89 is almost fully functional again. This maintenance project will help people to get from Milton to Franklin County more easily and ensure the safe travel of others using I-89. The ability to travel safely is beneficial to human capital and the access to reliable transportation networks can ensure access to jobs outside of Milton. Green, G. P., & Haines, A. (2016). Asset Building & Community Development. Los Angeles, Calif.: SAGE Publications. Lamdin, C. (2016, November 3). Bridge project to begin paving. Milton Independent.